The end of midterm season (and the looming of finals) got you down? Want a break from the party scene? University grind shoving your creative spirit down the drain? Ink Movement's got your back with our latest event, a night of spoken word poetry at Kafein café-bar! Sit down, relax, and enjoy an evening of powerful ink that speaks to the heart. After all... "Medicine, law, business, engineering, these are noble pursuits and necessary to sustain life. But poetry, beauty, romance, love, these are what we stay alive for." Whether you're a novice or an experienced writer, this workshop will offer fun and useful techniques to demystify writing and help you write creatively in any form. Led by four established Montreal writers, it will get you working and thinking about writing in new ways. No experience is necessary; all that's required is a willingness to write! 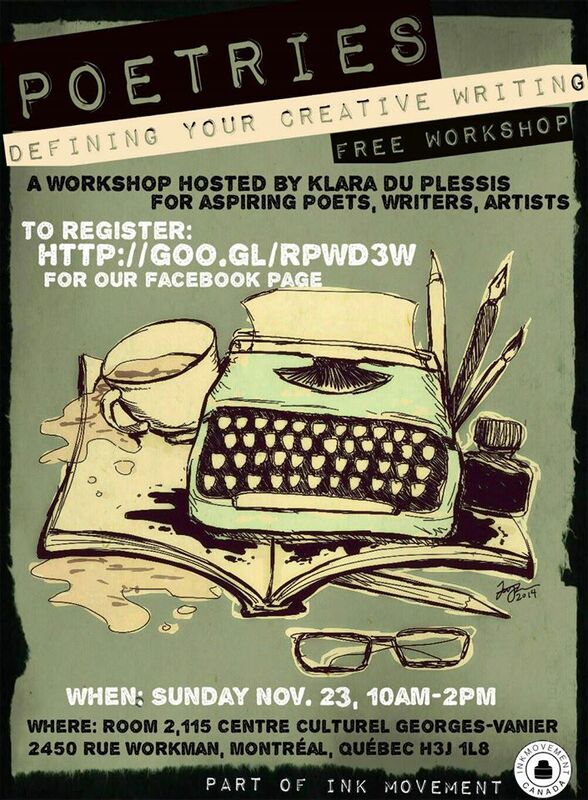 Please bring your own pen and paper- only a very limited quantity will be available at the workshop. Aimee Wall is a writer and translator from Newfoundland, currently living in Montreal. Her fiction, essays, reviews and translations have appeared in such places as Maisonneuve, Lemon Hound, The Coming Envelope, and Matrix Magazine. Her translation of Testament by Vickie Gendreau is forthcoming in 2016. Klara du Plessis recently completed a book of poems about contemporary female experience. She enjoys multi-disciplinary work and has collaborated with composers and visual artists. Most recently, she wrote and performed in a multi-disciplinary show of poetry, music and dance, Medusa Shaved (Montreal, December 2013). She was shortlisted for the 2013 Robert Kroetsch Award for Innovative Poetry, and curates the monthly Résonance Reading Series. She holds a MA degree in English Literature from McGill University.